The HUNT for the USMTS Season Championship rolls through Wheatland, Missouri for the 9th time as the Stars and Cars of the United States Modified Touring Series make their only appearance of 2018 at the “Diamond of Dirt Tracks”. The Ozark Golf Cars USRA B-Mods and the Big O Tires Street Stocks will also be in action. 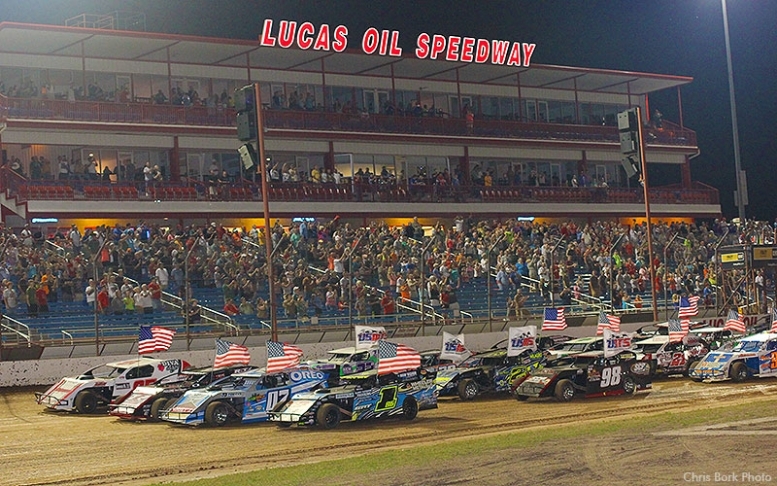 In addition to the action on the track, the 2nd annual Red White Blue & Que Presented by Lucas Oil Speedway is set for Aug. 4-5. The Kansas City Barbecue Society-sanctioned competition will bring some of the nation's top barbecue teams to south-central Missouri - and raise funds for a worthy cause. Following a military-inspired theme for the second straight year, The Warriors Journey, an online resource for military warriors and their families, will benefit from the barbecue-event proceeds. Visit TheWarriorsJourney.org for more information on the organization based in Springfield, Mo., and the ways it offers help to military veterans and their families. The barbecue teams, which will set up on the Lake Lucas midway, will compete in the KCBS competition on Aug. 5 with a prize fund of at least $5,000 on the line. Red White Blue & Que is a Missouri State Championship points event and a qualifying event for the American Royal World Championships and Jack Daniels Invitational, two of barbecue's majors later in the year. 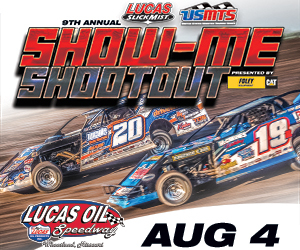 Before the races on Aug. 4, at approximately 5 p.m., a celebrity panel of USMTS drivers will judge a "just-for-fun" contest on the main track's midway of food cooked by the barbecue teams that choose to compete. There also will be a Kids' Q for youngsters at Lake Lucas from 6-7 p.m. For more information on Red White Blue & Que, contact contest organizer Michelle Higgins at MichelleHiggins31@yahoo.com or by calling (417) 682-1568.